« KFC or Korean Fried Chicken! This guest Chef recipe was sent to us by none other than internationally loved Canadian Chef Michael Smith. 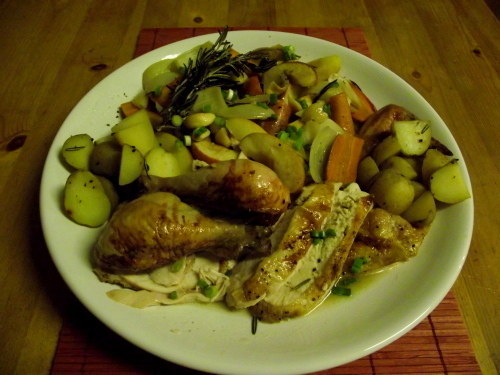 You’ve undoubtedly seen his smiling face in one of of his many cooking shows (Chef Abroad is my favorite) so now you can cook like him with this super easy and undeniably delicious Roast Chicken with savory pan stew! As Chef Michael is a champion of using fresh local ingredients, everything that I have used to re-create his dish has been farmed/grown/raised right here in BC, as per his recommendations. The more we support our local farmers and producers, the more great products we’ll have available to us! I have to say right now that my husband- normally very well spoken- groaned and grunted through this meal. There was yelling, there were gestures, and I’m pretty sure that he’d leave me if Michael would have him. I’m not freaking kidding people. I’m a little worried right now. Preheat oven to 350. 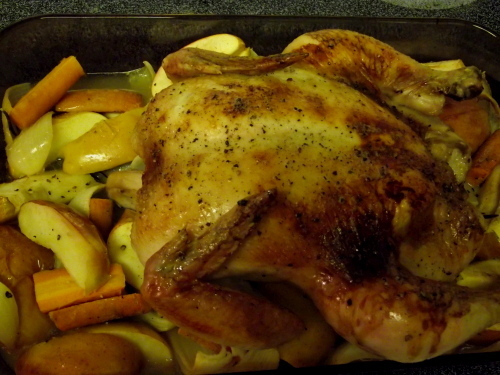 Toss the apples, onions, carrots, garlic and rosemary together in a roasting pan that is also large enough to hold the chicken. Season well with salt & pepper and pour in the cider. Season the chicken well and rest on top of the apples. 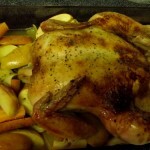 Roast about 20 minutes per pound or until a meat thermometer reads 165 in the thickest part of the thigh. As soon as the chicken is cool enough to handle, slice, cut, shred, tug and otherwise remove the meat from the carcass using any tools at your disposal. Toss the meat with the apple stew, sprinkle with green onions, serve and share! Along with the recipe he also included a reminder that the carcass can be reserved to make a rather excellent chicken stock! Just throw it in a sauce pan with an onion, celery, carrot and a bay leaf. Cover and simmer for an hour or two. 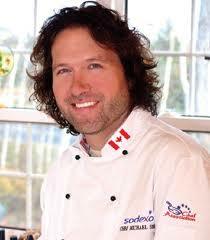 Thanks again to Chef Michael Smith! I really loved this one! If my husband emails you, please ignore it. He’s a wee bit in love with you right now.